One of the projects I am contributing to is the Comic Creator’s Alliance. It is a cause aimed at raising Human Trafficking, otherwise known as slavery. Seems slavery is more prevalent now than hundreds of years ago and that’s got to change. Comic Creator’s Alliance will be offering a downloadable wallpaper for readers who donate to the fund raising drive. This wallpaper will be packed with art from myself and many other awesome artists (some I’m very happy to call friends) from all over the world. More information on this cause here. 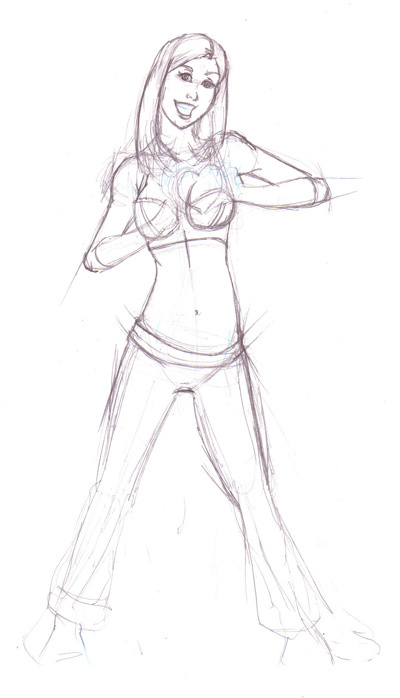 Just to show you what I got in-progress, our very own Ultragirl. ‘Ultragirl’ Sabrina Mancini is the top model in this… Charity.. I wonder how to donate? hmmm? Hey MGC! Thanks for asking. You’ll be able to donate and get the wallpaper January 11th. how to donate? heheh? through? in the website didn’t specify the instructions hehe! The button won’t be up until January 11th. Right now we’re enlisting creators and spreading awareness. I wasn’t aware that slavery was still an issue in the 21st century. Maybe I can donate something. Maybe this is just me talking as an artist, but I like seeing the pencil stage more than the finished product. We’d love any support you’re willing to give. Pencils are mighty fun to see. Sometimes, they’re night and day from the finished product.